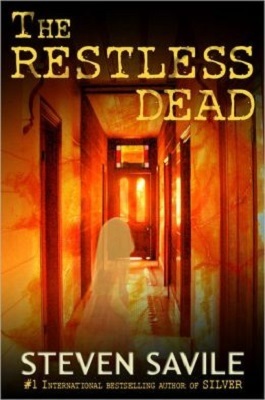 The Restless Dead is a short horror story, written by Steven Savile and available in eBook format. It’s a decent tale that most readers should be able to finish in about an hour. I bought a Kindle copy, but the story is also available to download in other formats, including nook and Kobo. The central character is a man called Stephen Carson. He lives in a haunted house that stands on one of the most haunted streets in Britain, but Carson does not want to believe in ghosts and their ilk. Deep down inside though, he knows these things exist, he’s had experiences with ghost since his childhood. Maybe that’s what encouraged him to become a horror writer and to take up a part-time position with a TV show’s team of psychic investigators. The latest haunt is a place called Cragside Manner. Carson has forgotten all about the investigation, so when the producer of the show rings him up and tells him he’s three hours late, He’s forced to take his young daughter Naomi with him because he cannot get in touch with his wife. Cragside Manner is a spooky, old place, but Naomi seems quite content to do a little exploring or play with her doll, and nobody seems to object to her presence. The investigation of the Manner marks a turning point in Carson’s life and he is forced to face some bitter truths about himself, his life, and the afterlife as well. Steven Savile is an accomplished author and has won several awards for his work, but the publishers of this eBook edition (Bad Press) have let him down slightly by allowing several typos to go unrectified. It’s not a huge problem, but every time I encountered one it distracted my attention and prevented me from becoming fully drawn into Carson’s world. The Restless Dead is an eBook though, so nothing is written in stone, and it is possible that an updated—and corrected—version of the book will replace the present one at some future date. I found some aspects of Carson’s life a little predictable, so the twist at the end of the tale failed to take me by surprise, but it’s possible that other readers may fail to see the route the story is taking. This is a story with plenty of meat on its bones though, so even those who do interpret the signs correctly should still have an enjoyable read. The prose flows well—until a typo rears its ugly head—and all the characters are easy to like. The Restless Dead is not a terrifying tale by any means, but it is quite dark in places, a nice level of creepiness is sustained throughout much of the story, and I particularly like the way Carson and his team’s resident psychic appear to develop a better understanding of each other at the end of the story. Recommended reading for anyone who likes a ghost story with some depth to it. UPDATE (18/05/2018): When I was updating this page, to make it mobile-frienldy, I discovered The Restless Dead is no longer available as an Amazon Kindle eBook. Nor could I find it available elsewhere.